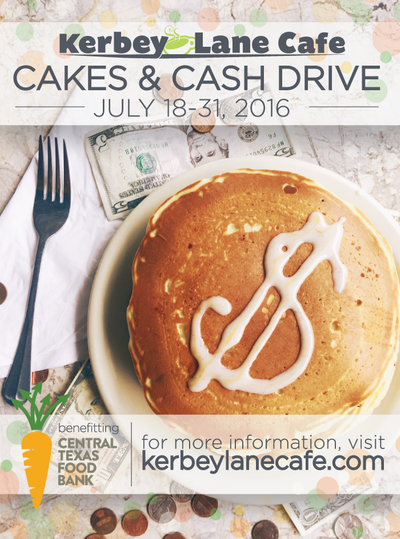 Kerbey Lane Cafe will host a “Cakes & Cash Drive” at all seven of our locations July 18-30, with all proceeds from our specialty pancakes benefiting Central Texas Food Bank. During this two week event, guests can purchase our special pancakes in any quantity and proceeds will go directly to CTFB (you can see our July Featured Pancake Lineup here). Guests will also be able to add a tax-free donation to the food bank to their check at the end of their meal. Kerbey Lane is a longtime supporter of CTFB (formerly Capital Area Food Bank of Texas). Since 2010, Kerbey Lane has hosted an annual food drive wrapping up the donations with a company-wide volunteer day at CTFB. In 2015, Kerbey Lane’s donations provided 1,227 meals for Central Texans in need. In the past, Kerbey has asked guests to bring canned food donations in exchange for a discount on their meal. This year Kerbey is putting a new spin on the event in hopes of making an even larger impact than in prior years. Rather than bringing in cans, guests can make an impact simply by indulging in some delicious pancakes. During the week of July 19, the specialty pancakes are the Elvis (peanut butter, bacon, and banana), Vegan Banana Pecan, and Gluten Free Banana Pecan. During the week of July 26, the specialty pancakes are the Raspberry Lemon Chiffon, Vegan Raspberry Lemon Chiffon, and Gluten Free Lemon Poppy Seed. Be sure to drop by any of our seven Austin-area locations between July 18-30 to help feed Texans in need. To celebrate the completion of the fundraiser, more than 60 Kerbey team members will volunteer at CTFB on Tuesday, August 2 from 9 a.m. to noon, and will also present a check for the proceeds of its Cakes & Cash Drive. “We focus our support for CTFB in July each year because volunteers and donations are most needed during the food bank’s busy summer months when children don’t have access to free or reduced-price school lunches and electricity bills are high,” says Kuda. Kerbey Lane’s specialty pancakes will be available at their regular prices and quantities during the Cakes & Cash Drive.